In Thanksgiving spirit today, the first thing that popped into my mind was that I was grateful that the kindness and skill of the Stanford Interventional Radiology staff. It made today one of my best hospital experiences yet. I’m dozing after spending the day at the hospital for another procedure to replace the jejunal feeding tube. It was a quick, out-patient surgery that was necessary because the little balloon of the feeding tube inside my body bursted, letting the tube pull out too far. In the pre-op room, I had three friendly nurses, including one of them who remembered me from 2 months ago. It is nice to go places where “everybody knows your name,” even if it is the pre-op room instead of a climbing gym. I told them the reason I knew to come in [to the hospital] when the feeding tube started coming out was that I had a very painful experience a year ago. 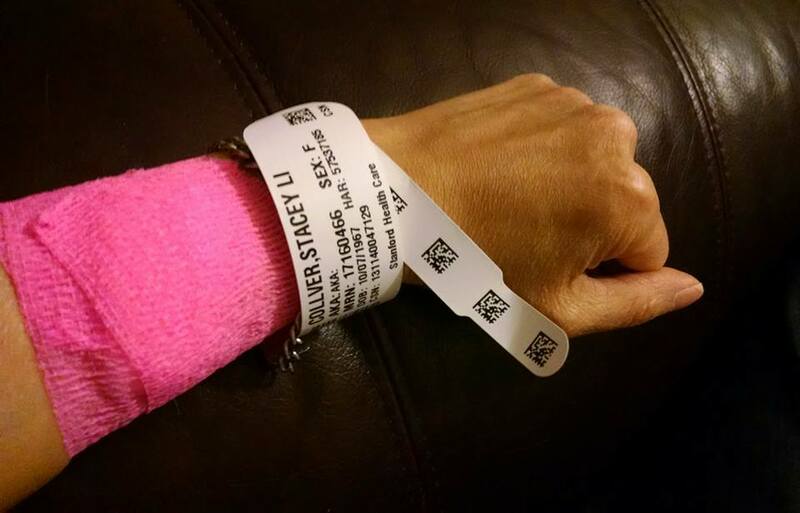 “I think the [original} feeding tube got displaced when I was rock climbing.” Apparently, that is not a very common reason, and they had a good laugh! Both of the Asian nurses had tried climbing and told me about the their experiences. “You inspire me to try it again…it’s so… meditative..” Knowing that she was talking about her first time, I was confused. “Most people are scared to death the first time, and hang on for dear life as they near the top!” She said she was calm because trusted her belayer [friend holding the rope for her] completely. We continued chatting about climbing and how wonderful the sport is, because you get stronger and it’s also so fun. After that, she said she (unfortunately) has the honor of putting in the IV needle. “Honor?” How sweet and respectful is that! She found a vein on my arm (IV’s on the hand hurt more.) She then succeeded in inserting the needle on the first poke, and it hardly even hurt…it felt like a little blood draw. The nurse on the other side of me was also a gym climber. She said she should get out her harness and start climbing again, but she was worried that she was out of shape. So, I said it’s best to start out again on the slab climbs. That way, she won’t even notice a difference in a recent weight gain, because almost all her weight will be over her feet. Back to business: after explaining to her that there is no way I could be pregnant right now, I was spared the pregnancy test. She went on to review my long medical history, and over 20 drugs and vitamins I take daily. A young surgeon popped in with a smile, and assured me that the balloon on these feeding tubes burst at random, and I was not at fault. In fact, he said he was amazed that my previous tube had lasted a whole year. However, I did not have time to ask if he liked rock climbing, too. In the recovery room, I awoke very groggy and feeling nauseated, but satisfied that I have a new “button” tube that stays inside now. Hi Stacey! I’m glad the visit to Stanford was good. And that the nurses there even like rock climbing! I plan to make it out to the climbing gym here in St. Louis tomorrow. Will be thinking of you. Have a wonderful Thanksgiving! Wind Song Journal is maintained by Felix Wong [contact].